This Roadster has had the same owner for the last 10 years. Always garaged in a climate-controlled environment. The obvious care is apparent from the moment you approach this car, it will take your breath away. The paint has a mirror finish that not many body shops can duplicate. It has no scratches chips or nicks. The previous owner was so fastidious that he refused to fold the convertible top behind the seats. He would remove it completely and wrap it in plastic when the top was down. The side curtains were also stored in this fashion. Consequently the top and curtains are like brand new. The interior is brand new using authentic materials, and installed by a skilled craftsman replicating the original factory look and feel. This is an “SE”, Special Equipment Model with wire wheels, fog lamps, and higher performance engine. 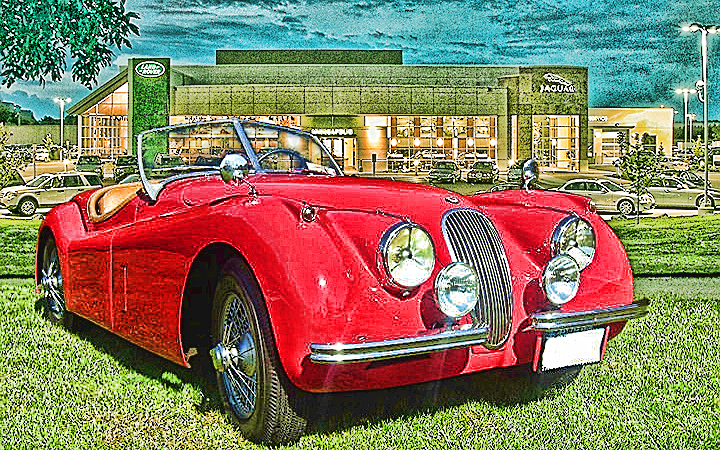 Later model XK120’s we’re available with the Racing developed “C” Type cylinder heads. This car is equipped with the modified head and accordingly produces 190 horsepower. This car drives just like it left the dealership in 1954 just as William Lyons intended.